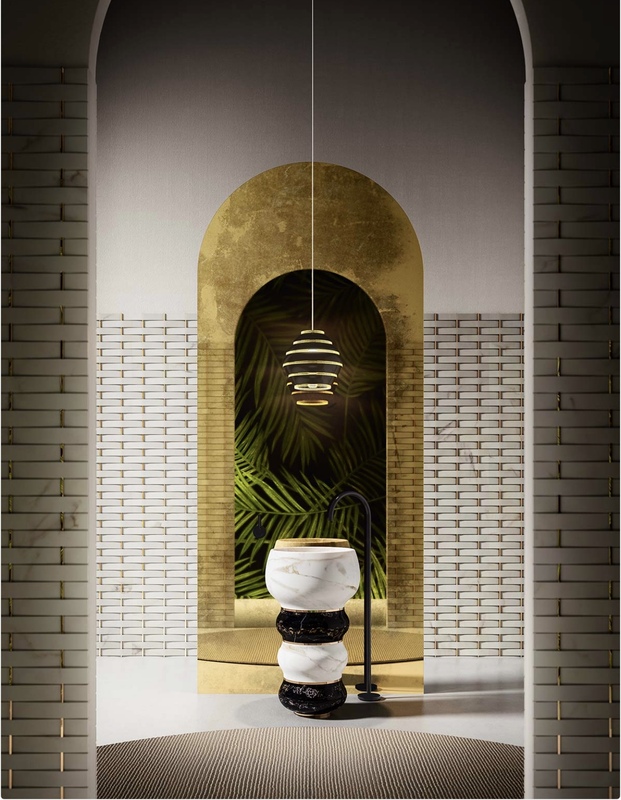 Kreoo, Italy’s noted makers of luxury bath items, furniture and tile, debuted new designs from some of the top names in Italian product design at the Spring 2018 Milan Furniture Fair, Salone del Mobile. The fair is a destination for top architects globally to discover the newest and most innovative designs for residential and commercial specification. 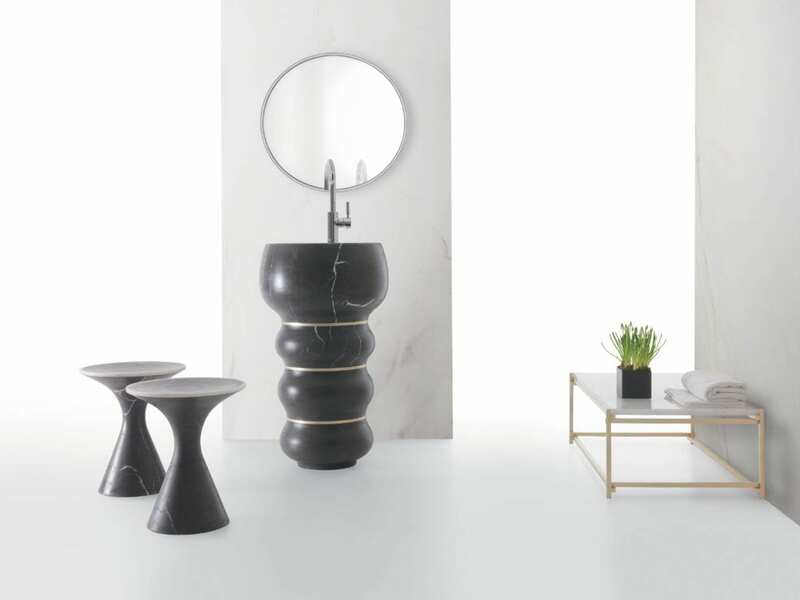 The new “Bubbles” washbasin, above and below, designed by Marco Piva for Kreoo, highlights the sinuosity and dynamism that can be acheived with marble and stone. Both the shape and name were inspired by the light and pleasing visual of soap bubbles floating in the air. Kreoo Bubbles sink shown with Pedina Stool and Nodo Table. 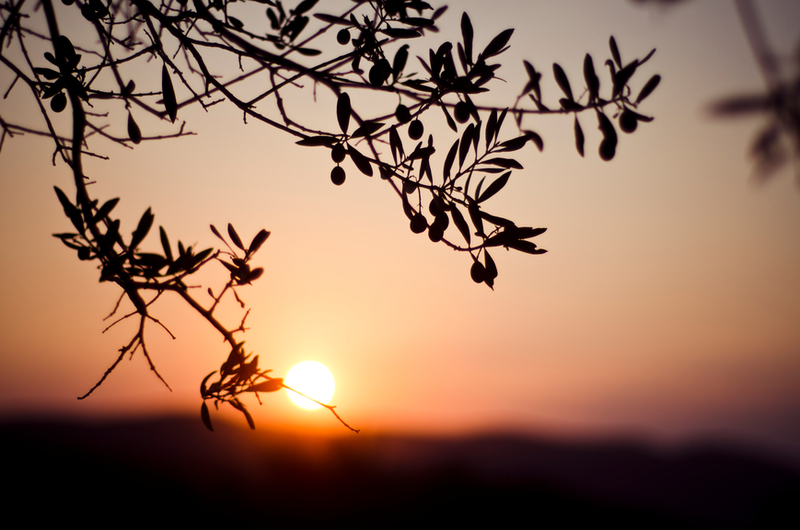 Photo: Decormarmi SRL. 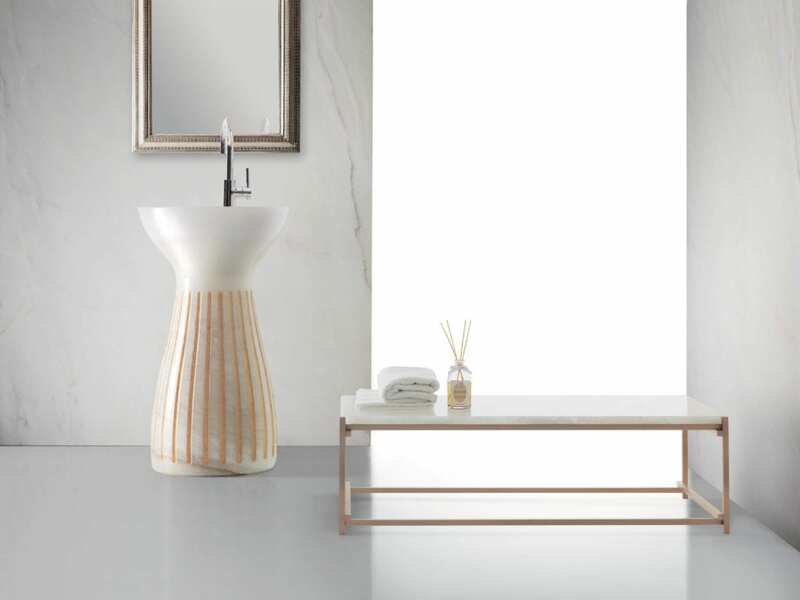 In the new Roma free-standing washbasin, designed for Kreoo by Marco Piva, natural marble meets the refined elegance of gold leaf. The bright lines of the contrasting material emphasize the washbasin’s sculptural shape and unexpected textural combinations. Roma offers a unique aesthetic, a combination of harmony and highlight, shape and function. The lines rise from the ground to define the water container, evoking the theatricality of the ablution ritual. In Roma, shapes of the past plunge into the future with a new expressive force. Conceived as free-standing washbasin, but also available as countertop-supported vessel sink, Roma is presented in the evocative translucence of Onice Bianco (White Onyx), with gold leaf inserts. Like Kreoo’s iconic Gong sink and Kora bathtub designs, Dora was inspired by sound. In the Dora design, the barrel shape of the traditional Japanese Doramu drum is combined with the conical shape of the West African Djembè and its system formed by ropes and circles. The result is a series of unique objects – an intersection of different cultures, with a strong Italian soul. The tables of the Dora collection are characterized by an open circular brass base, with thin, brass rods, inspired by the djambè strings. The large space created by the opening of the base and the distance between the supports, combined with the shine of the metal, gives an unprecedented lightness to a historically heavy material. The top is made of marble or semi-precious stone. Dora is crafted from the most dynamic materials of the Kreoo collection: marbles with marked veins, works of art in themselves, they embellish the environments of everyday life, giving it a suspended charm between exotic and contemporary. 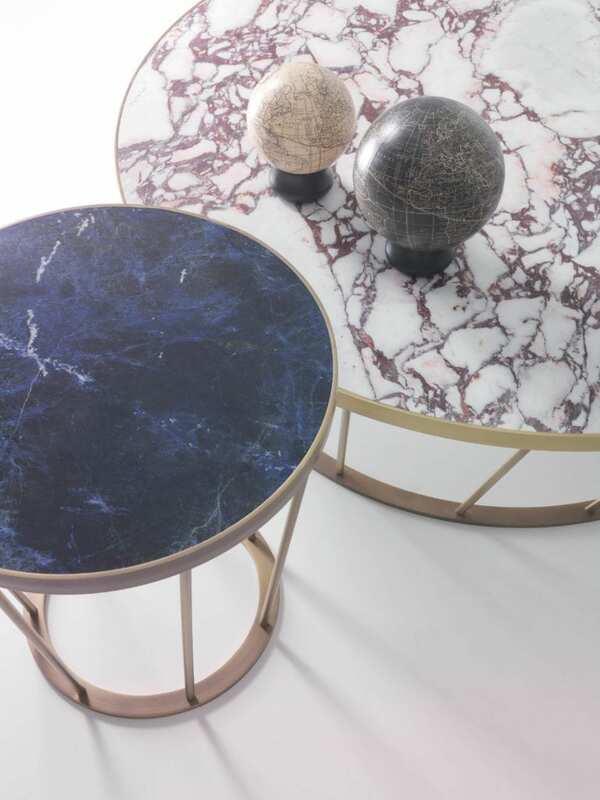 Kreoo Dora coffee tables shown in exotic Calacatta Viola marble and Blue Sodalite. Photo: Decormarmi SRL. 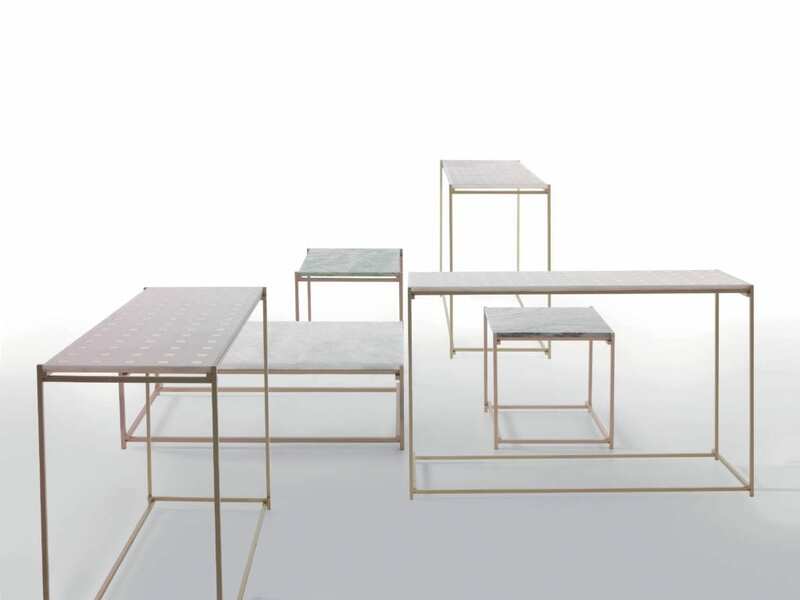 Nodo is a new family of coffee tables and shelves, characterized by geometric elements with essential shapes, in which the marble top rests on linear brass profiles. Imbued with a light and contemporary visual impact, the marble’s veins emphasize the uniqueness of each element. A significant detail is the elegance of the angular joint of the profiles, which is able to support the top while making it appear “suspended” on two sides, giving the solidity of the material an unprecedented lightness. The effect of the joint looks like a knot, hence the name of the collection: “Nodo”, in Italian, means knot. Made in different heights and sizes, for a total of four models with a rectangular or square base, they can create innovative modular compositions or stand alone. The choice of the top is customizable by choosing among the stone materials available in the Kreoo catalog or some very exciting decorative stone with metal marquetry from the Ducale tile collection by Kreoo which can be crafted as slabs for the table top. Kreoo Nodo tables may be used in modular arrangements or stand alone. Photo: Decormarmi SRL. Named for the inspirational American Icon, “Jackie” is a new table in Kreoo living collection – a tribute to the United States of America, Jackie is a piece of furniture that tells a story of a strong character, where marble is the protagonist. The Jackie design is offered in the finest, most precious marbles characterized by strong veins, such as dark Sky Onyx, Blue Sodalite, White Onyx, Calacatta Gold, Nero Portoro and Emerald Green. All are offered in a choice of highly polished or matte finish. The profile is made of opaque, golden, rosé or bronzed brass. 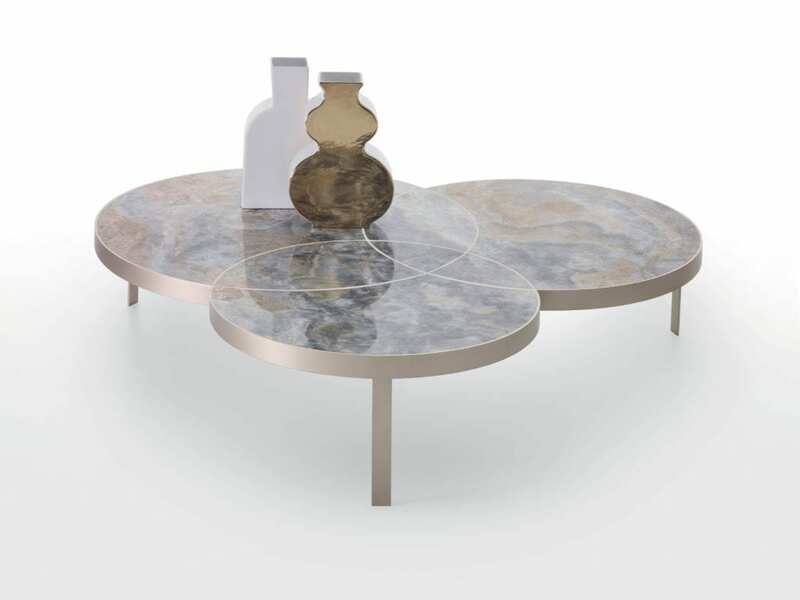 A work of art in itself, the table top is carved from a single marble slab and configured by the intersection of three geometric elements, sinuous and circular. The result is a kind of modernized trefoil, merging classic beauty with a decidedly modern outlook. Kreoo’s new Jackie cocktail table shown in Light Sky Onyx and opaque brass. Photo: Decormarmi SRL.